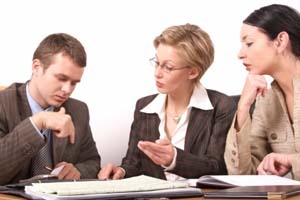 Mediation involves only the parties and when represented, their attorneys. Attorneys do not have to be present at the mediation but are encouraged to attend. If not present, your attorney will have ten days to review any written agreement reached before it can be enforced. Mediators are professionals who charge a fee for their service. Each party will be responsible for one half of the fee, to be paid directly to the mediator at the time of service. Persons qualifying as indigent will have their fees waived. Application for waiver of fees should be made in person at the ADR Office prior to the date of the mediation session. A cancellation fee may be assessed if the session is cancelled or rescheduled with less than forty-eight hours notice to the mediator. The parties are responsible for paying the mediator for a minimum of two hours at the beginning of the session. Mediator’s hourly fees vary and are available in the ADR Office. Parties in cases in which the mediator has been assigned by the ADR Office will pay $100.00 per hour. Both parties may mutually agree upon a mediator and the date and time for the session. If the parties cannot agree and the selection has not been made within ten days of the date an answer is due, the ADR Office will assign a mediator and set a date and time for the session. A list of mediators is provided to the party who filed the action. The mediation process is quicker and smoother for those who come prepared. First, determine your specific interests that need to be addressed. Outline the issues and bring any documents you believe to be relevant to your position. In domestic cases, a Financial Affidavit is required in all cases involving child support, alimony, division of property, modification of alimony or attorney’s fees. You should also bring any other information which will help settle the issues involved.